Titled Caritas in Veritate (the English title is “Love in Truth,”) the encyclical will be presented Tuesday in a Vatican news conference. 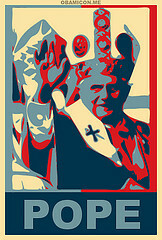 I’ll be on hand for it, as well as for Pope Benedict’s meeting with President Barack Obama next Friday. All three points can be understood as partial versions of one “grand dichotomy,” that between truth and love. For those interested in drilling down, however, I suspect “synthesis” will prove a helpful way of pulling the document’s strands together. Scrutinizing what’s already on the record about Caritas in Veritate, it seems this “both/and” spirit is likely to pulsate through the document. Perhaps no single idea is likely to loom larger than the insistence that a real fix to the global economic crisis — which, of course, has to involve looking at structural matters such as trading relationships, tax policies, lending practices, and so on — must first be rooted in personal conversion. Unless individual human beings act ethically, and see themselves as accountable to the common good, any system can be hijacked, subverted and corrupted, however noble its design. A few days ago, unofficial extracts from Caritas in Veritate were published in the Italian press, and this idea figured heavily in those passages. “Development is impossible without just human beings, without economic and political leaders who live the appeal to the common good strongly in their own consciences,” the pope was reported to have written. We don’t need leaks, however, to get a sense of what’s on the way, because most of Benedict’s public remarks during the past week have seemed like a preview of the encyclical. To some extent, this emphasis on holding the personal and the social together reprises a key idea from Benedict’s first encyclical, Deus Caritas Est, in which he argued that programs of social justice can never eliminate the need for individual acts of charity. In a sense, Caritas in Veritate is likely to apply the same insight to the economy: There’s no economic justice without individual morality — rooted, ultimately, in truth. As he has elsewhere, Benedict is likely to reject any attempt to pick and choose among the church’s social teachings, particularly when it comes to the wearily familiar tendency among Catholics to splinter into pro-life and peace-and-justice camps. In that spirit, Benedict said that spiritual renewal requires “non-conformism,” an unwillingness to “submit oneself to the scheme of the current epoch.” Benedict recalled Paul’s insistence upon an “adult faith,” mocking the use of that phrase to justify dissent from official Catholic doctrine. Benedict specifically highlighted opposition to abortion and gay marriage. The leaked portions of Caritas in Veritate suggest that Benedict will come back to this point in the encyclical. A third recurrent tension in Catholic life runs between a primarily “vertical” spirituality, focused on the believer’s personal faith life and relationship with God, and one that’s more “horizontal,” emphasizing the community of the faithful and broader engagement with the world. This tension sometimes ends up putting missionary efforts and social justice activism at odds, as if preaching the gospel were a distraction from building a better world. On other occasions when Benedict XVI has touched upon social themes, he’s argued that not only can vertical and horizontal spiritualities be reconciled, but that the former is a sine qua non for the latter. There can be no just world, the pontiff has insisted, without Christ, who is the source of justice. Benedict acknowledged that a vertical spirituality “must not serve as an excuse for avoiding the historical reality in which the church lives as she shares the joys and hopes, the grief and anguish of the people of our time, especially those who are poor and afflicted.” Yet Benedict insisted that social solidarity likewise must not dislodge proclamation of Christ, participation in the sacraments, and the promotion of holiness. According to the extracts making the rounds, Benedict will make this point too in Caritas in Veritate. Words, Words, Words. What is needed is not more of the same. We need an authentic example of the Gospel proclamation of love. This document will be met with a holy yawn from most people in the pew.